I arrived in Seville on 15th of November and settled at a Barceló Renacimiento Hotel. Registration took place on the 16th November after which the participants had very good presentations from two main speakers at a Plenary Session. I was impressed with Jo Bergmann’s presentation on “Flipped Learning”. Bergmann from Flipped Learning Network (USA) argued that traditional way of teaching should move from being “passive” to “active” learning as there is an overwhelming advancement in technology which can improve performance and growing uncertainty on education funding. Flipped learning is basically a blended learning of face to face with instruction teachers or lectures and technology based instruction which students engage out of school. At home students actually enhance learning through videos and other multimedia materials that explain concepts as teacher does during a lecture. As I listened to the presentation it occurred that probably this is an area of interest for research to assess the performance of student’s, participation and performance of female students and those living with disabilities in flipped learning. I represented EGHE Network on Friday the 17th of November and my paper was well received by participants especially, from African Universities. Academics recommended highly the activities of the Network as they were familiar with challenges which affect female students and policy related issues in their higher education institutions. For instance, comments purported that most Universities have a gender policy but it is not being implemented – thus there are challenges of “policy” versus “practice”. A few Universities showed interest in joining EGHE as Associate Network members. 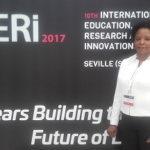 I attended other sessions and I was particularly impressed with the presentation from Brazil where the presenter mentioned a lack of role model for female students to engage in STEM subjects and exposure to out of school STEM activities. It was argued that boys engage in different STEM activities, for instance, repairing and fixing things at home. Unlike girls, who don’t engage on STEM related activities at home. Therefore, schools are coming up with out of school STEM activities for female students. Another area of interest from another presenter was an innovative and integrated approach of universities working in consultation with employers to ensure that students find employment after university. This means developing soft skills for students in preparation for jobs as employers value social skills. Another area was issues affecting students living with disability. It is evident from presentations that there is a growing population of students with disabilities in universities and they face many challenges. The presenter suggested that in addition to family and academic support students need self-advocacy and determination skills to impart knowledge on their rights which will lead to improved academic performance. The International Conference was worthwhile and the proceedings will be published. For more information visit the website: http://iated.org/iceri.